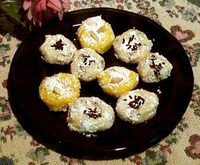 This highly adaptable recipe makes small, sweet nibbles, perfect for the afternoon tea dessert tray. You can color, flavor and decorate them virtually any way you like. Experiment! Add softened cream cheese to a large bowl. Gradually add the powdered sugar and knead until no longer sticky. Divide into portions - as many portions as you want, to produce different colors and flavors. If you're just making one flavor/color, leave as one lump. Knead in food coloring, using just a drop or two to start with, until you get the color you want. Add flavoring. Some liquid flavorings are quite strong, and you will only need a few drops. Some you will need up to 1/2 teaspoon. As with the food coloring, start with small drops and continue adding to taste. Some of my favorites: Almond, vanilla, lemon, orange, peppermint, rose extract. (Yes, I said rose. If you have a rose bush, you can actually crush a few petals and add them to your mixture. I'll be posting more about cooking with roses later on.) For chocolate flavor, just add a tsp of unsweetened cocoa. Obviously, coordinating color with flavor makes a nice visual as well as taste treat. Break off chunks and shape into 3/4-inch balls. Roll in powdered sugar. Flatten balls with a fork. NOTE: Don't succumb to the temptation to make them bigger. They're so sweet that most people can't eat more than two or three of the small size. Optional Decoration: You can use the fork tongs to press ridge patterns in the edges. Depress the center with your thumb, and press in a small candy. Red hots for the peppermint flavored ones, lemon drops for lemon flavored ones, etc. Shown in the photo here are vanilla flavored with chocolate sprinkles inside, and on top, and the yellow are almond flavored with almond slivers on top. A nice touch if you're serving these for afternoon tea is floral decoration. A rose petal for the rose flavored ones, obviously, but any kind of flower petal looks nice pressed into the center. This is the fun part. Be creative! Let dry at room temperature. Store loosely covered in the refrigerator. Serve cool. What a great idea!!! I love that, I have to try it. One of my favorite secret vices is marsheeeeeno cherries. Oh, this is going to be so decadant! These remind me of the "Cherry Surprises" my Mom used to make every Christmas. Instead of making a ball and "denting" the center for a candy or other embellishment, you "wrap" the dough around a green or red cherry. Voila. When you bite into it...surprise! A cherry. Heehee!